When Kaitlin Curtice speaks, people listen. Raised a Southern Baptist, as she grew older Kaitlin began to explore her family’s rich history in the Potawatomi Citizen Band. Kaitlin tells us what life is like as an indigenous woman in the United States today, how she’s teaching her kids about their heritage and how we can rally around teachers of color during their hardest moments. Kaitlin reminds us we have a responsibility to incorporate a wide range of voices into our world and remember the power of empathizing with an experience different from our own. One of the most poignant lessons she gives us: God is is inviting us into the sacred, and it’s not in a far-off sunbeam or reserved for the church pew—the sacred is all around us, from the daffodils on the street corner to the popsicle-stained smile of our kid, even as we are consoled in our pain and grief. God’s glory is in everyone and everything. We only need eyes to see it. 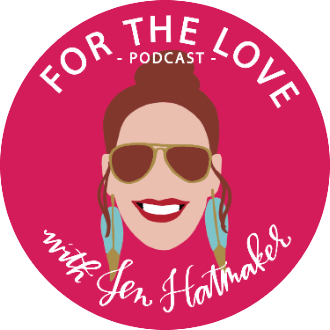 Jen: Hey, guys, Jen Hatmaker here, your very, very happy hostess of the For the Love Podcast. Welcome to the show today, really glad you're here. We are in the middle of a series that is so fascinating to me. It's called For the Love of Faith, Groundbreakers, and we are talking to some of the leading voices out there who are asking really important questions and pushing on traditions and forcing us to sort of consider new perspectives and they're doing it with courage, and grace, and grit. I am learning so much from my guests in this series—not at all excluding today's guest. You may or may not know my guest today. And if not, I am so excited to introduce you to her because she is someone I really want all of you to be paying attention to. She brings such an important perspective to the table right now that literally every one of us needs to be listening to. 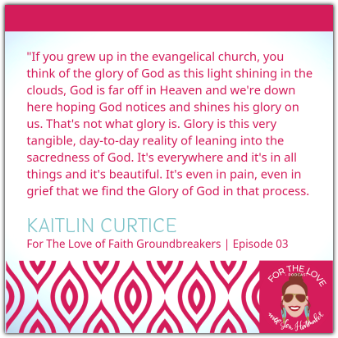 My guest today is Kaitlin Curtice. 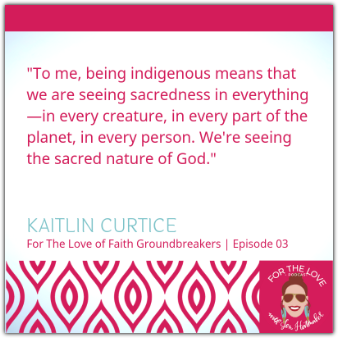 Kaitlin is a Native American Christian author and speaker. She is an enrolled member of the Potawatomi Citizen Band and someone who grew up in traditional evangelical faith. Kaitlin writes on the intersection of indigenous spirituality and faith in everyday life and the church. It is a powerful perspective, and she is a beautiful writer and an amazing leader. 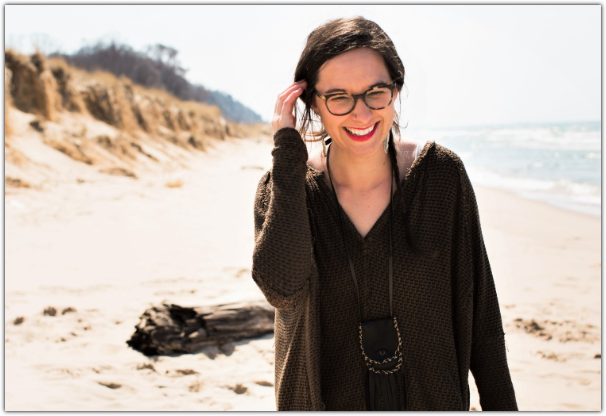 Kaitlin travels all around the country speaking about faith and justice within the church, specifically as it relates to indigenous people. In 2018, she was actually featured in a documentary with CBS called Race, Religion and Resistance. She was speaking on the dangers of colonized Christianity. She's going hard, you guys. 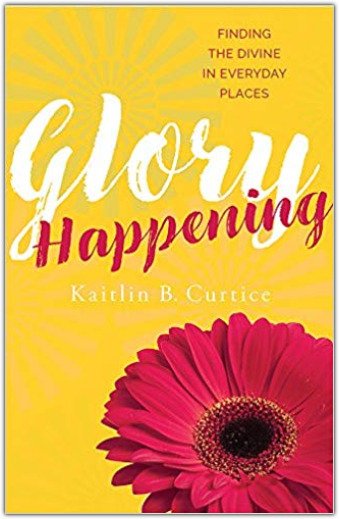 Her first book Glory Happening: Finding the Divine in Everyday Places was literally just a beautiful, artistic, offering. If you haven't read it, you will just love it. She's a very lyrical and beautiful writer. She's actually in the middle of writing her second book, which we're going to talk about on this show today. On top of all this goodness, all this amazing leadership, she's also a mama to two boys, a fabulous partner to her husband Travis, and a tried and true coffee drinker. I'm so happy she is on my radar. I was introduced to Kaitlin's work maybe about a year and a half ago on Twitter, of all the places, and began listening to her powerful story, and her powerful perspective, and her very courageous leadership inside the church. And I am telling you, I have learned a lot from her. You are too. Wait until you hear this interview—she really dials in to some concepts that have the potential to remain invisible or dormant for those of us in the majority culture. I can't wait for you to listen to our conversation. I think it's going to intrigue you, I think it's going to inspire you. I think it's really going to make you think. She is just a delightful, and a warm and a wonderful human being. And so with that, you guys, I'm very pleased to share my conversation with the smart, and the talented, and the fierce Kaitlin Curtice. Kaitlin, I'm really, really, really glad to have you on today. Thanks for joining the show. Kaitlin: I'm so glad to be here. Jen: I'm trying to think where I very first picked up on you and your work and what you do, it was definitely online, on Twitter, which is where good feelings go to die, that's all I can really tell at this point. But there is some goodness over there, including you. Then we met face-to-face in Grand Rapids, right, this last year at the Festival of Faith and Writing? Kaitlin: Yeah, that's what it was. Jen: It's been interesting to watch you just since then, even, just catch so much traction in your work and in your ministry and in your leadership, to begin watching all these other people discover who you are and start following your lead. Has this been kind of an exciting time for you? Kaitlin: Yeah. It's been unreal, really. Jen: You've handled it really, really well, and I think you're leading in a lot of strength right now, and we're going to get into that. But first, I've told our listeners a little bit about you, and there are tons of facets of your life, frankly, that I completely identify with. You're a beautiful writer, you're a mother, a partner, you're a daughter and a friend and an advocate. But first, if you don't mind, I would love to hear you talk about the Potawatomi part of your story. You're an enrolled member of the Potawatomi Citizen Band. Obviously you couldn’t possibly speak for every person in the Potawatomi Nation. But I would just love to hear from your perspective more about your people, your history, who the Citizen Potawatomi are today and your background growing up in that group. My story, I was born in Ada, Oklahoma. I grew up in Oklahoma and also New Mexico. My dad worked for the Bureau of Indian Affairs, so he was a police officer hired to basically police other Natives is what the BIA does. So it's not always great, but that's what he did. Growing up in Oklahoma, so the Potawatomi Citizen Band is in Shawnee, Oklahoma, that's their headquarters. Jen: Sis, you know I went to college there, right? Kaitlin: I know exactly where you went. Shawnee is where our tribe is, so we've grown a lot in the last two years. We have a lot more resources, we have our own language program, where Justin Nealy is someone who teaches the Potawatomi language that I've been learning from. Just doing with what we have in Oklahoma, which to some people it's not a lot, but to some people it is a lot. Is just trying to connect us back to who we are. The Potawatomi are originally from the Great Lakes Region of the United States. We have a few different bands or groups, so there's still Potawatomi in the Great Lakes. Like in Michigan when we were there for the Festival of Faith Writing, I was able to spend some time with some of the Potawatomi people there, which was really meaningful for me. It's the first time I got to go and see the water and to see this place where my people are from. Jen: That was your first time last year? Kaitlin: So I was able to go to the water and just be there and listen and remember. Some of the Potawatomi, we had our own forced removal. The Cherokee Trail of Tears is a forced removal. The Potawatomi people have the Trail of Death. Some of our ancestors were forced out and down into Kansas. That was a forced removal . . . We have a Prairie Band, also. Then some of the people ended up going to Oklahoma, and that's where my ancestors are. That's where my family is from. You know, the effects of assimilation and of erasure are all very real still. I think that all indigenous people are striving to return and ask what it means to know who we come from and know our ancestors. For some of us, it's just that constant asking, “What are the effects of assimilation? What are the things that have been taken from us, and how do we gain those things back again?” For me that has been learning my tribe's stories, learning that we have a language. I didn't even know that growing up. Kaitlin: Understanding and learning all these things for myself, and now being able to teach it to my own children has been really meaningful for me. Jen: So you describe yourself as a Christian mystic. Sometimes even in evangelical circles of course the term “mystic” is like, "Woo woo. What's going on here? Does that mean magic? Is that sorcery?" There's not a real clear understanding around that term. It has more of a negative connotation, probably. Will you deconstruct the term mystic with us and what it actually means? Explain it in terms of this is what you believe about God and this is what you believe about your role in the world and this is how this informs, how I live out my faith. Kaitlin: The term mystic can actually be problematic on a lot of levels. Of course you have the evangelicals who are terrified of it, dark magic and witchcraft. Kaitlin: The other side of it is this New Age, hippie idea of, "We're Christian mystics, but we're going to basically appropriate other cultures and call it being a mystic." I find that that's also really problematic because you're erasing cultures who, if you want to say are mystic in nature, cultures that to me being indigenous means that we are seeing sacredness in everything—in every creature, in every part of the planet, in every person, right? We're seeing the sacred nature of God. That has also been co-opted by hippie culture and by New Age, but also in Christian mysticism. I think that there is a danger of that. I think we have to be really careful for me. I haven't even used the phrases much lately because of that problematic side of it. The very nature of being indigenous is you're in that space of trying to bear witness to the sacredness of the Creator and of this world. Kaitlin: There's nothing about the earth meaning anything, there's nothing. You're subduing it, that's all you need to do. So to find even a vein of Christianity that is willing to say, "No, the creatures of the earth matter, and they have a voice." That was meaningful for me, and I think gave me hope that I can find my place. That may mean that I don't use the term mystic at all in the future. It may mean that I use it, but I have this conversation with it trying to make sense of how it can be problematic on both sides, right? Kaitlin: It's a complicated thing. Just as identity conversations are complicated and what language do we use, I believe that all people are wired to be mystics. I believe all people are wired to be poets or artists in whatever way that comes out of us. 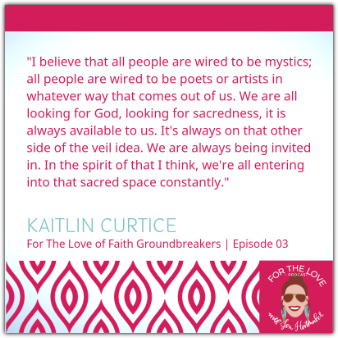 Kaitlin: That we are all looking for God, we are all looking for sacredness, that it is always available to us. It's always on that other side of the veil idea. We are always being invited in. In the spirit of that I think that all people and all creatures, we're all entering into that sacred space constantly. Jen: I love it, and I couldn't agree more. That's something I've had to learn as an adult. I was also raised Baptist like you mentioned. Just so much was omitted, including creation and just how holy creation is as well. To that end, you talk, and you write very eloquently about your personal journey, not just to deconstruct—but I think this is super important for us to learn from you—not just deconstruct, but decolonize your faith. Can you tell us how you began to do this because again if this is not a part of your childhood and adolescent vernacular, if you were raised to assimilate, this has to start somewhere. I don't know where this started for you and what you've learned about your faith since, and frankly, why it's crucial for every one of us to do this, really no matter our heritage. This is mission critical for the church. Kaitlin: My faith in high school and through early college was unwavering, you don't ask questions. I was the poster child of the Purity Movement. I was a worship leader. Kaitlin: I did it all. That meant that I trusted every leader, and I didn't ask any questions. I remember the first time I went to a world lit class in college. We were talking about a story from the Bible, and someone was like, "This story is ridiculous, and God is stupid. Why would God do this?" I went home that day to my husband, and I was clutching my Bible just like crying. Kaitlin: I thought I was going to go and teach everyone something. Kaitlin: And I didn't. That was a first chip, I think, of realizing that. And for me deconstruction came first, then it led to this decolonizing work. For me, of course, that came with beginning to learn who I am as a Potawatomi woman and asking those questions I never asked when I was younger because I didn't know I could ask them. Kaitlin: In America, we can't ever go back to what once was before we were colonized. We have conversations about reparations, how do we return the land, how do we do these things? I don't know the answer to that, but I do know that every day any person can do any small thing or large thing to help breakdown systems of colonization. On a larger scale let's talk about in the church our mission's frameworks and how they are actually colonizing people all over the world. Let's be honest about that. On a smaller level, let's make sure that our kids’ libraries are diverse and have different stories in them. On another level, let's make sure that we're not repeating toxic stereotypes for Native people. Kaitlin: Things like that. In my mind it's all . . . It's the work of everybody, and it is possible to do these tiny things that do, they matter. Kaitlin: They really do matter. If we're parents leading our children in a better way, it’s the thing that's going to lead them to lead their children in a better way. We have to know that that's possible. Kaitlin: I think that that's helpful. Jen: I appreciate you saying that because sometimes the gap, the work feels daunting. There's so far to go, but there really is an accrued effect of measures both big and small, certainly on our own minds and souls, but definitely generation to generation. It really does build. You mentioned parenting, you have two boys. Personally, if we can zero in on your family, how are you raising your boys? How are you helping them learn about their heritage and celebrate it? Even underneath that, how are you equipping them to become critical thinkers who recognize the diversity of their own heritage and can take their rightful places in society and teaching them about God and faith and their role in the world. I have to imagine it looks pretty differently than the way faith was handed to you as a kid, right? Kaitlin: Yeah. I find our children are so much more ready to think critically and to engage the hard things of the world than we think they are. Kaitlin: Or we act like they are. They're so beautifully resilient. I can have one conversation with my kids about being Native or being Potawatomi or racial reconciliation conversations, something about justice. They will, in their own way and their own time and in their own beauty, will take it to whatever next level they need to. They will do it on their own. They're coming home from Black History Month, and they're talking about Ruby Bridges. And they know—my seven-year-old knows that the world is hurting and that he has an important role to play in it. We're having important conversations about privilege, because I'm mixed, I'm white and Native. My boys, they're white and Native. We have white skin, we need to know what that privilege means, but we need to know that we have to step into our story as indigenous people as well. Holding all of those intersectional conversations is hard, but they get it, they really do. A Native friend of mine reminded me that in Anishinaabe, in our Native culture we believe that children are closest to God, because they're fresh from God, they're the freshest from God, right? Kaitlin: When we deny our kids these important conversations, we're not allowing them to dream and to dream of a better world. They have so many dreams. They have so many abilities to make things happen, even as kids. I didn't go to my first protest alone, I took my boys, and they led me. They did all the chants, they knew what to do more than I knew what to do. It was so beautiful to see this beautiful act of resisting and fighting against injustice is so natural to them. They know it in their bones. That gives me so much hope for the future because I can hand them a little, and they'll know exactly what to do with it. Kaitlin: We have to trust our kids with that. Jen: That's really good. I see that in my kids too. I'm really, really hopefully for their generation and what they're capable of and prepared to receive and do with their little slot on this earth. Jen: I wonder, we started this line of conversation a minute ago, but I wonder if you could take it a bit further for us. How do we create systems of thought or of faith, of culture that don't just lift up, but help center people who have been or are currently being oppressed? What do you think that looks like? What sorts of practices, what kind of thoughts do we have to begin putting into rotation in order to center people who have been chronically de-centered? Kaitlin: One of them is just actually having this conversation about whiteness, because I think what I'm finding is happening is when black, indigenous, or people of color point out systems of whiteness or systems of racism, I think that white people see that as a personal attack. Kaitlin: Instead we need to be constantly understanding these things, they do start as personal things, but these are systems that we have created in the United States. These are systems of injustice. We are complicit in those systems. Kaitlin: When we point out you're participating in racism, or you're participating in just terms of whiteness, the church needs to understand the humility in saying, "Yes, we have been complicit in these systems. 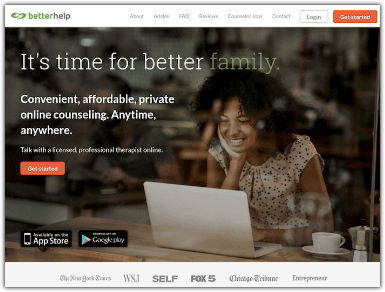 We've helped even maybe create these systems," this is not a personal attack. This is an, "Okay, lets then get to work together." Kaitlin: That leads to what you're saying which is decentering whiteness in any way possible. I know that that's really abstract for people, and that's why I always start with buy books. Buy books. Kaitlin: Buy books by people that are different than you. I have a list of 25 books by indigenous authors on my blog. Go there and buy three of the books and read them. Then you are stepping into the story of someone who is not like you, and you're learning from us, and you're giving us money, which is empowering. Kaitlin: I always start with books, but I'm a writer. Start with artwork that's from . . . Give your money, give your time, give your attention. This whole idea of passing the mic, it can't just be pass the mic, but then you narrate everything. Passing the mic is really give power over and let someone else lead and see what happens. I think that is happening, but it's also we have so much work to do. I have to hold the bigger picture in front of me all the time, but I have to then bring it to these tiny tangible things that we can do every day. Which is books and art and that kind of support that people can grasp because it is tangible enough. "Oh, I can buy a book. I can read a book." Start there if you need to do that. Jen: That's great. It's the lowest rung on the ladder, anybody can grab it. And you'll be shocked at how much those . . . that early channel of input can change you and how quickly you can climb the ladder of overturning some of these systems. I know when I grabbed the lowest rungs a few years ago, as someone who just had a real sense this injustice was passing me by and I didn't understand it—because I, of course, my entire life have been centered. It's very possible to never know any of this if you're white, it's possible. You can stay hunkered down in your silo and assume that it's normative, it's normal. We had a podcast last year with Lisa Sharon Harper, who just did this masterful job of explaining the concept of whiteness in a way that was new—even to my ears and I've really immersed myself—but it is possible to change. These things, I'm thinking about my listeners right now just going, "Gosh, this feels above my head or I'm not sure how to grab onto some of these ideas." I'm just telling you that what you just said, Kaitlin, is that when we pull up a chair and decide to learn from indigenous leaders, from black leaders, from people of color, it matters. It does. It does, it really does matter. It really begins to form and shape our ideas our perspectives, our perceptions, our concepts. And you could be actually shocked where you could be one year from now if you decide to humbly put yourself under that leadership. One thing to that point, that I admire so much about you is the way that you personally amplify voices from people of color, from people who have lived their lives in the intersections of society. So I wonder if you could just briefly tell us the teachers that you are really paying attention to right now that are teaching you, that are really mentoring you or showing you a path that you're following. Kaitlin: I'm working on my second book right now, so obviously I am immersed in so much indigenous literature because I want to quote other indigenous writers, so that when you read my book, you'll go and read their books, right? Kaitlin: That's important to me, just as many books as I've been able to get my hands on. Twitter is the most amazing resource to me that I never expected. I'm not even sure I can give you the names, but well Rabbi Danya is obviously someone who has meant so much as a Jewish leader. Even friends in Atlanta that I've been meeting with. My black friends in Atlanta where we're able to have conversations about how is our oppression different and how is it similar. Kaitlin: And how do we move forward in that idea of Intersectionality by Crenshaw? How do we practice intersectionality as indigenous and black people? How do we move forward together? Gosh, my queer friends, friends with disabilities, I think that we need to be having so many more just conversations across these divides. Kaitlin: Inter-religious conversations. Conversations between straight and queer, all of these identifiers and all these labels that we have. Not that we need to get rid of the labels, but we need to be able say, "We're labeled this and you're labeled that, how do we talk about our labels together?" I just find that Twitter can be horrible, but it can also be this amazing place where those conversations happen if you're willing to be humble to do it and dig in. Jen: I agree with you. I think when used well that can be also a good front door. Just to say, "Okay, I'm going to sit and listen for a while." I've said this before, but one thing that I have learned so much from is Tasha, Tasha Morrison's policy in her . . . I've had Tasha on the podcast, everybody.. She leads a huge racial reconciliation organization called Be the Bridge. She has this private Facebook group of people who are interested in learning. It's big at this point, gosh. It's over two or 3,000 people. But her rule—and I love this. Of course, it's led by people of color, it's moderated by people of color‚—is if you're white, and you're coming in here to learn and this is sincere, you're not coming in here to fight, you're in here to learn, her rule is you can't say anything for three months, not one thing. You can't respond to anything. You can't reply to a comment. You can't put your, inject your opinion. I chuckle because it's like telling white people they can't inject their opinion, it's so shocking to them. Their opinions have always been centered. And so watching . . . I'm telling you that three months matters. If you are willing to listen and learn, you can be shocked actually how far the needle can move in your own life. Let me ask you this question, because you're uniquely equipped to answer it. What would you say to indigenous people, to black folks, to people of color who are . . . they're tired, frankly. They're mad, angry, they're tired of being angry for having to raise their voices every single day just for justice, just for equality. And they are weary. What would you say? What would you say to them? Kaitlin: Something I learned from Austin Channing Brown has been that it's okay to be angry because I grew up now knowing what anger was. I never allowed myself to feel angry about things. I just went with the flow of everything and said it was fine. I felt emotions like sadness and empathy, but I’ve never allowed myself to be angry or to grieve that way. It has been so freeing especially within the church to be angry, to go to church mad every week. Kaitlin: That’s been so good for me. I would say we are expected to give answers to white spaces, just out of the goodness of our hearts. I can't tell you how exhausting every year is around Columbus Day and around Thanksgiving for me because there's no other time of year . . . oh, and Halloween now, as well. People especially at Thanksgiving will all of a sudden start messaging me asking me to help them read the right books to their kids. Kaitlin: I'm being traumatized just on my own because of this holiday and trying to understand how do I even live through it and what do I teach my own kids? So the pressure that's put on us just to be teachers. Our work is automatically more traumatizing, so self-care has to be part of our life, and some people can't afford therapy. Someone helped me pay for therapy, I couldn't afford it but I needed it so badly. It saved my life and being able to have people say, "I'll pay for this for you because your voice matters.” And it's been validating for my own voice to know that my voice means something. Kaitlin: We are teaching, so we need to be able to hold that and be able to hold self-care with all of the stuff that we are constantly battling, if that makes sense. Jen: It makes perfect sense. What I would add to it as a white girl to my white listeners, because that was really beautiful and profound advice to all my listeners of color, but for the white people who are interested in learning and you want to learn, this is a space that you need to and want to know more and you want to put yourself into a humble place of being taught, being led, being mentored. I want you to hear what Kaitlin is saying, which is this entitled expectation that any of our friends of color or leaders of color or authors of color around us are expected to do our own heavy lifting is incredibly unfair. The truth is like with anything else, if you're sincerely interested, you know how to learn. You know how to Google. You can put yourself into environments in which you are not the majority voice, and you're just sitting there as a listener and a learner. I think this always rattles white people because it rubs up against their good intentions. Do you know what I mean? They mean well. They mean well. Jen: So do your own work. Just do your own work. It's not that hard. It really isn't. There are a million lists online. “Google, where do I start if I want to learn about indigenous history?” I promise you, you will not be lacking for any sort of resource. I really appreciate you saying that, because that is one of those perspectives that often just doesn't even occur to well-meaning type people. I want to go back to something you said a second ago, you talked about grief. You recently wrote an article for RNS, Religion News Service. It was convicting. And from that article I took away your really salient point that in our sanctuaries, in general, we do not provide an open, safe space for people to grieve, to bring their grief right in the doors. So the pain of our hurting is relegated to these private places, right? It's just not given space to be active and aired right in the middle of us all. I think that was a really insightful and important observation. Can you talk a little bit more about that? And why you believe it's so important to hold room in public, in our churches for people who are grieving, people who are oppressed? And how do we do it? What does that look like to you? Kaitlin: Yes, I wrote that piece because a friend of mine at my church had lost her daughter, and it was right before Christmas. I checked on her that morning, and she was sitting right in front of me in worship and left. I was feeling the energy of everyone. That time of year is so beautiful, but so hard for so many people, but I knew her story. As soon as she left the room I had that moment where I'm asking myself, "Is this invasive? Should I go?" I'm whatever, I don't care. I just went and I sat with her in the bathroom and cried. I was so angry because I imagine sometimes what if people just lose it and they want to just wail in the middle of church. Do you know how much our churches would freak out? Kaitlin: It would be so uncomfortable and would be like, "I don't know what you're doing." Kaitlin: "This isn't the time or place." I went to Twitter and I asked people, “How have you seen grief suppressed by the church?” And people's answers were heartbreaking. The way that we hold funerals and it's all about a celebration of life, and it ignores the fact that someone has been taken from us out of this space and how do we keep going? We don't give those resources. Some churches do it. Some of us do it, and it works. I would say communally we don't. There's this one side of these individual hurts and this grief, but then there's this communal . . . I'm grieving the history of America, in which the church has been complicit in killing indigenous people and genocide, that God's name was used in that. The government worked alongside the church to do these things to us. I carry that into church with me every week. It's difficult to know that and then to carry the injustice stories of other people of color and to wonder does anyone in this white church know? Does anyone care? How do we actually practice lament and grief. People have written on this and people have examined and questioned this, but if a church can't come to grips with its complicity in these things, I don't think . . . If we can't learn to grieve together, then the individuals grieving is going to be lost too. If we can't do it. If we can't come together and have a lament service for women who have been abused or these systems that we have created, like I said earlier. These systems of whiteness, of colonization, of toxic patriarchy that have been a part of the American church. How American white church, how do we do that? We have to talk about it. Jen: Yes we do. In our church here in Austin since, I don't know, probably three months along at this point, we at the end of every service. We're down here in Central Texas, so we're pretty close to the border where there is just so much suffering and separation of families, and criminalization of these brown bodies. At the end of every service, and we're down there right now a lot, this is where we're focusing our energy, we read out loud right before Communion, letters that people, teenagers and young adults have written in the detainment camps. They've written these prayers. We went down and said, "If you write a prayer out, we would love to read it in our church." We read their prayers in Spanish, and then we read them in English, and they’re just devastating. The whole sanctuary is just sobbing every time, it's this grief, this shared grief. But it's interesting to watch the Holy Spirit's power crack through those places of grief—not just joy, not just victory, not just celebration, not just tra-la-la church as business as usual, but making a little bit of room for this lament, this absolute heartbreaking sorrow has been really powerful in our sanctuary. You also, you also decided to organized a way for pain to be validated and recognized in your church in a really, really powerful way, and you called it a Hannah Day. Can you talk a little bit more about that and what that has meant? Kaitlin: Yeah, my friend Shelly actually had done this service before, and she organized it for women around Mother's Day. Mother's Day is one of those days at church where it's like, "We're going to celebrate moms and motherhood!" And then you have all these women who can't have children or who have lost children—and fathers too—who are just grieving and hurting, and you are here sitting in a service being happy and giving away flowers. How hard is that, right? That's directly ignoring such a visceral pain. My friend Shelly wanted to lead this, and so I was there for support and led worship and did some songs. We do not know how to be quiet by ourselves or together, and so I think that being in that place, they did some tangible things like they made things with ribbons to remember the children they lost or they did these things that were very tangible to help them process. But for me, I've never lost a child. I've never miscarried. Just to sit there and just sit in quiet and be with them and play music if I need to or just be quiet or let someone talk to me if they need to. We are so wired for healing to go a certain way, and for our services to go a certain way, for these things to happen a certain way, a very Western way of thinking. We don't want to sit in it. We don't want to hold that space, no matter how hard it is. It's sad because we lose a lot if we don't do it. Jen: I agree. I think the depth that that brings to our faith communities is really irreplaceable piece of the whole story of God. If you care about the Bible at all, there are enormous whole swatches of it that is nothing but grief, nothing but lament. I mean, words of lament, songs of lament, prayers of lament, sorrow. They weren't precious about it. The people of God have never been self-conscious even about it, but rather this always seemed like something that God made so much room and space for the grief and sorrow of his people. I'm not sure when we decided that all of our expression of church or faith communities here in America had to be shiny and all victory and all happy, but that's just half the story at best. I mean, at best. Kaitlin: Right. When we focus on this individualistic faith, even individualistic sin, individualistic salvation, we are missing that communal aspect. Kaitlin: After I wrote that piece a woman whose family survived the Holocaust, a woman emailed me and said, "Your story means something to me. Your story as an indigenous woman and the genocide of your people mean something to me as a Jewish woman with family members who survived the Holocaust." Kaitlin: To read those stories and have that solidarity with someone else. Imagine if our churches if we looked at each other and said, "I see the communal pain of your people and I also see resilience, but you can't always see the resilience unless you see what you came out of." If we just actually practiced that, how different everything would be. And then we would be colonized because we would see very quickly what we've done. Jen: That's right. That's a great point. I like that story. Jen: Hey, guys, Jen breaking in for just a quick second to talk about an offer from a great new sponsor. You’ll see why I think so in just a second. Tons of us grew up in a time when the internet wasn’t even a thing. I often think, How in the world did my generation make it through our education years without having the World Wide Web at our fingertips? I mean, honestly, to write reports, to buy textbooks, or have study help. I literally can’t believe we did it. We are champions. Well, this generation, including two of my college kids, can benefit from that and the amazing resources of this online study site. It’s called Chegg. 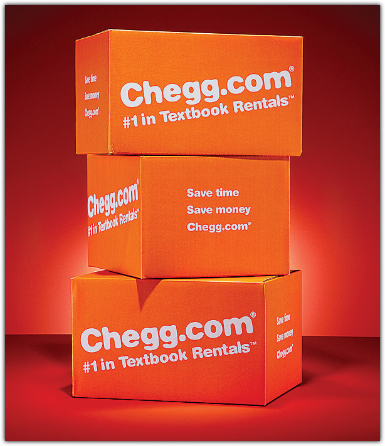 So whether you need textbook solutions or expert Q&A, Chegg is the leader for online study assistance. So you can tap into Chegg’s massive library of textbook solutions. You can search their database for literally over 24 million solution sets for subjects as diverse as accounting to mechanical engineering. You can learn how to solve the toughest problems with video walkthroughs and practice sets. 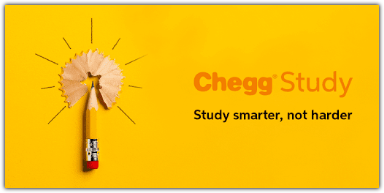 And what’s awesome is that Chegg is literally affordable for students, and they have a special offer for our listeners. For $5 off your first month’s subscription, go to Chegg.com/ForTheLove and use the promo code FORTHELOVE. Great, great resource. All right, let’s get back to our show! Jen: So if people want to hear more from you, which obviously they're going to want to. They can go just straight away and read your book Glory Happening, which you're such a good, gifted writer. It's just a really, really beautiful reading, everybody. You just get lost inside the words and inside the pages. You're a writer's writer. Can you just talk for a minute about Glory Happening and what you were hoping that your readers would take away from it? Kaitlin: Yeah. So that book was 50 short essays that I wrote. They were basically reflections on these different parts of my life, present day and past, just all over the place where I basically just drop you into a story and you have to go with me. I loved doing that. And I wrote these prayers with them that were actually meant to be poems because I think that prayer is poetry, so I wanted them to read like poems. The idea is that if you grew up in the evangelical church, you think of the glory of God as this light shining in the clouds, God is far off in Heaven and we're down here hoping God notices and shines his glory on us. That's not what glory is. Glory is this very tangible, day-to-day reality of leaning into the sacredness of God. It's everywhere and it's in all things and it's beautiful. It's even in pain, even in grief that we find the Glory of God in that process. So I kind of just go through these different types of glory, I guess, is what I called it. It's just these stories and it's an easy, they're easy short reads. I wanted people to just be able to grasp a little at a time, as much as you need, and enter into those stories with me. Jen: That's so great. And you mentioned you are writing book number two. Congratulations! Can you just give us the quickest, "Here's the 30,000-foot view of what I'm writing about?" Kaitlin: Yeah. I'm telling my story as a Potawatomi woman. Also, this idea of how do we all return back to the pure, childlike place of God where we are truly known? Even past identity, how do we enter into that naked place with God? The pure place of knowing and being known. It's that, but through my story. Jen: That's so great. Does it have a title? Kaitlin: Right now, the working title is Native: the Origins of God, the Origins of Us. Jen: Nice. When's it coming out? Kaitlin: I think it comes out next summer with Brazos Press. We are asking everybody in the Faith series these questions, here's the first one. Just the top of your head. If you could just pick any Faith Hero to sit down over your favorite dinner with who would you pick? Kaitlin: I grew up loving Sojourner Truth, so I think that would be really wonderful. Jen: Oh nice. Oh that's good. That's a great answer. Can you imagine? Can you even imagine? Kaitlin: No, I can't even imagine. It would be amazing. Jen: What about this. Do you either have . . . This could be from a big pool. Either a verse or a spiritual idea or a quote or a mantra that would capture maybe the core essence of your faith? Kaitlin: There's this phrase in Potawatomi, it's the phrase basically for good morning, it's mno wahbin. Kaitlin: Mno wahbin. In Potawatomi our words are verbs, like, our nouns are active, right? Mno wahbin literally is that time when the sun rises and its light shines. It's saying it's good that that happens. Kaitlin: I think that's everything for me, that it is good when light shines on us. It is good when we bring things to the surface, when we are honest, when we are vulnerable, that it's good. Calling things into that space is a good thing. Learning and being humble is a good thing. That phrase, from the moment I learned it and understood it, has stuck with me and has been so important to me. Jen: You have to title at least some future book that. That is so profound. That is really profound, and a beautiful word. I would love for that to make its way into the general lexicon. That is a wonderful and a gorgeous concept. I'm dead serious. I want to see that on something, a podcast, a book, I don't care what you do, something. That is a beautiful, beautiful umbrella. This is our last one, we ask every guest, every series this question. Excuse me. You can answer this however you want. If it's profoundly important or absurdly silly, it can be anything, we've had all answers. It's also from Barbara Brown Taylor, who you probably love. Also, one of my great teachers to connect me back to earth and creation. What is saving your life right now? Kaitlin: My husband and I are watching Madam Secretary on Netflix. It has given me a little hope in politics, just a little. Kaitlin: But also, the family dynamic on the show is beautiful. They have three teenage kids, and they really love each other. Our family is in one of those seasons where we're dreaming ahead. We're on the cusp of some new things, and so having that, "What will our life be like in 10 years?" Or that kind of thing. It's just one of those shows that allows us to dream and to think ahead. I just really love . . . I just need that right now. It’s been good. Jen: My mom is watching Madam Secretary right now, and we can't get her to answer the phone. She is so gone. We'll see her again when the series is over, I suppose. But she is equally loving it. And I will just say, as somebody who's a click ahead of you as a parent, I love that you're dreaming forward. I love that you're thinking about your kids as teenagers because it is such a fun season of family. You're just going to love it. When I was parenting where you're parenting right now, kind of in the elementary, earlier, younger portion of parenting, I just decided when I was your age and my kids were their age that I was going to like the teenage years. I just decided. I'm going to, that's going to be a really connected time in our family. That is something that I'm going to enjoy. My parents enjoyed having teenagers, they were into us. And I'm just telling you, you can tell your mind what to do. Our kids drive us crazy, of course. Let's see in the last two weeks we've had one kid ineligible for his sport and another at Saturday school. It's not like it's all going great. Jen: That makes my heart feel happy that you're looking ahead with anticipation and excitement for your next 10 years, because you are absolutely going to love them. I want to tell you something. I want to say to you that I am very, very proud of the way that you are deeply stewarding your story, your heritage, and your voice right now. I think you're doing it with a great deal of courage, which is saying something these days, and grace, which is also saying something these days. Those are both in short supply. The fact that you are doing them well equally and I find you leading with a lot of strength and clarity of conviction. I'm noticing the people around who are going, "So this is a perspective that we've left out, even as we've been working on other places of intersection." I'm really proud of how well you are centering your story and your community. I can't wait to see. I cannot wait to see the walls that crumble around you. It is really something to watch. Thank you for your work. Thank you for stepping into it. Thank you for sort of being the lead blocker for so many people behind you. That is important work, and I think you're gifted for it. You're called to it. Well done, you. Jen: You're welcome. Everybody all of Kaitlin's stuff I'll have linked over on the podcast page at jenhatmaker.com, all of her book, her blog, all of her socials. Everything that we talked about, we'll link up the article that we mentioned that she wrote, it will all be there. If you want more Kaitlin, you've got more Kaitlin. Anything else? Anything else you want to just say, this is where you can find me or this is what you do or anything like that. Kaitlin: Just find me on Twitter, you know? Jen: That's your pulpit, it's your best pulpit. Yes. Yes. Okay, perfect. Thank you for being on the show today. Jen: She's a good one, you guys. I'm so pleased to introduce her to so many of you today. I'm telling you you're going to want to go over and follow her on her accounts. Really start listening to what she has to say. I think she is just a really fierce yet gentle teacher, one that every one of us can learn from and listen to. I so sincerely hope you will. 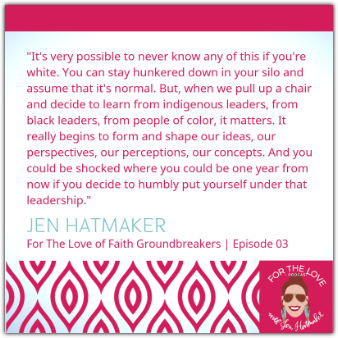 As mentioned, all her things will be linked over at jenhatmaker.com under the Podcast tab, where you will also find the entire transcript of our conversation. Bonus pictures, links, all the stuff. Amanda builds that out for you week after week just as a service to you, as a tool and a resource for you. Thank you for listening. Thank you for keeping your mind open. Thank you for being such a really great community who is able to hold tension, able to hear another perspective, able to ask hard questions and stay in hard places with one and other. I’m very, very proud of this listening community. To that end thank you guys for subscribing. We have so many subscribers. Thank you for rating and reviewing this little podcast. It's done such wonders for us. When you like an interview, share it. That is fabulous. Just throw it around on your socials, on Insta or Facebook or Twitter. Share the interviews that you love with your people, conversations that you really want them to hear. 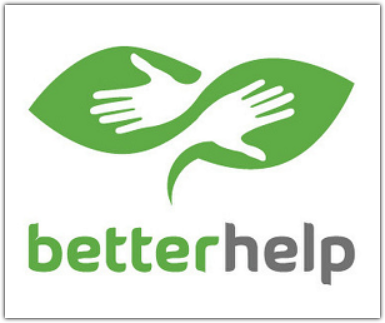 We're happy to be a partner with you as you advance conversations in your own community. Much more to come in this amazing series. We've extended it because we have too many fabulous guests that we wanted to talk to. This series is a little bit longer than normal because it's just that good. Come back next week, more important and interesting conversations ahead. We're not afraid. We're not afraid of any topic, we're not afraid of any conversation. We find a lot of healing and liberty inside courageous and vulnerable discussions with one another. Thanks for joining us, you guys. See you next week.